No one saw it coming; an indifferent tryout in the provinces, a cast of little reknown, a skeleton production of an epic narrative; no advance sale--not a promising candidate for making history. But on June 30, 1960 it took London by storm, and not even those (more than a few) naysayers could stop the public from embracing the show with a rare furor--including the Royal family. And what a relief that a local boy had set Dickens to music--after those cheeky Americans made mastery out of Shaw. 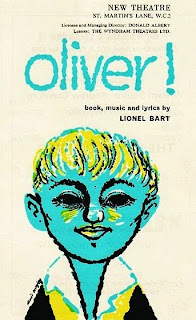 Here, at last, was a West End sensation Americans loved; the one which marked the true beginning of the modern British musical--the kind that travels beyond its borders; that kind that becomes itself a Broadway musical: Lionel Bart's Oliver! David Merrick quickly snapped up the rights for America but didn't rush it to NY; staging a lengthy tryout tour partially subsidized by the subscription houses of the Los Angeles & San Francisco Civic Light Opera companies, followed by stints in Detroit and Toronto. Despite his many hit musicals, Merrick hadn't yet scored a true blockbuster, and thought this would be the one. But after six months the SRO sign came down, and the show didn't quite last two years (tho still profitable) on Bway. In London it ran for seven, a new long-run champion, but unlike previous record-holders, Chu Chin Chow, The Boy Friend and Salad Days, Oliver! was a worthier jewel in the West End crown, and a milestone for the British musical much as My Fair Lady and Oklahoma! were for Bway. I can't fathom why London theater seasons have never been chronicled the way Bway's have been--since the early 20th century. You'd think the British would be even more diligent than Americans in recording their history, but as far as I've discovered there is no Brit equivalent to the Burns-Mantle Best Play series or Theatre World pictorials. But one remarkable tome I've come across is a history of the post-war British musical called A Tanner's Worth of Tune by Adrian Wright that covers the genesis, journey and impact of Oliver! in such brilliant analysis as to make any other superfluous. Consider yourself informed. Remarkably, Oliver! was solely authored by Lionel Bart--much as The Music Man was by Meredith Willson--a rare achievement in the creation of musicals. Whether Bart had a leg up on Willson for adapting an existing work is debatable; an original play isn't shackled to its source, especially one as familiar as this. Countless dramatizations since publication 130 years earlier, included at least three silent movies, and many more later on film, TV and the stage. Dickens' own stage adaptations of his works weren't well regarded--his mastery of the dramatic form nowhere as successful as his prose. Bart managed to do a respectful, satisfying and coherent job while adding 16 tunes that make the story romp. It's not so much a reduction of Dickens, as a distillation--a captured essence; hitting all the emotional marks of the story but in a style and a sound more contemporary than period. A pretty stunning achievement, and one not forseen by those following the path of the pop song-writer, whose brief but accelerated career in theater consisted of lyrics only for a bawdy Henry Fielding (of Tom Jones) musical: Lock Up Your Daughters; and the score to a cockney "Threepenny" knockabout called Fings Ain't Wot They Used T'be--using slang so local even Brits needed translation. These were hits but Oliver! was a phenomenon. Lionel Bart was London's newest treasure--the homeboy hero, the overdue heir to Coward's mantle. Noel himself was working hard at a third act resurgence--but his musical gifts were truly thin this late in the R&H revolution, and his brittle comedy at odds with the Angry Young Men dominating 60s British theater. Bart was thirty--fresh from the Brit pop-rock scene with tunes for stars like Tommy Steele and Anthony Newley. He was also Jewish--something utterly alien to the sensibilites of Coward; and something that comes thru in Bart's music--supporting the theory that all the musical comedy greats (but Porter) were Jews, and even Porter knew to write "Jewish" melodies. It's the currency of musical theater. (And therein perhaps why Coward's tunes have rarely pleased my ear much.) Interesting how 20th Century American music has predominant roots in Jewish and African traditions. You've got to hand it to Lionel Bart; like Bob Merrill, he was musically illiterate--he'd hum his compositions to others for notation. And yet he has his own distinctive signature. His meteoric career continued post-Oliver! with another two West End hits, but again too colloquial to travel: Blitz! (which soothed the painful memories of the Great War into a comforting nostalgia--not unlike the patriotic bromides Coward used to wax) and Maggie May--a working-class Liverpool ballad opera. And then...Twang!! Years before Ken Mandelbaum set into theatrical lexicon, "Not since Carrie," Bart's disastrous Robin Hood parody could easily take the crown for the West End, "Not since Twang!!" (the double exclamation marks were the give away). But Carrie was a product of minor-talents untried on Bway; Twang!! was a serious misstep from London's golden boy; one from which he sadly never recovered. At least Bart had some saving grace when Oliver! reached the screen. He'd written the score quickly after Fings, and apparently in a joyful mood. Tho the novel is prone to melodrama, with serious social commentary, Bart finds a breezy sing-along quality to the song-list. 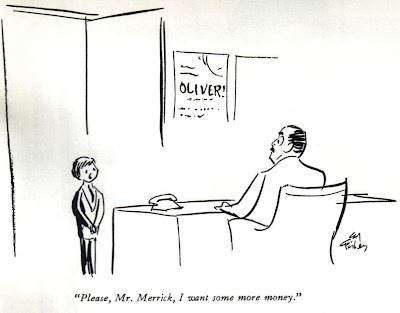 Take "Oliver"--one of the least prominent title tunes from any musical--a horrifying moment for our hero, Twist, suffering a public scolding--and yet it sounds like a sprightly school-yard jingle, anything but grim. 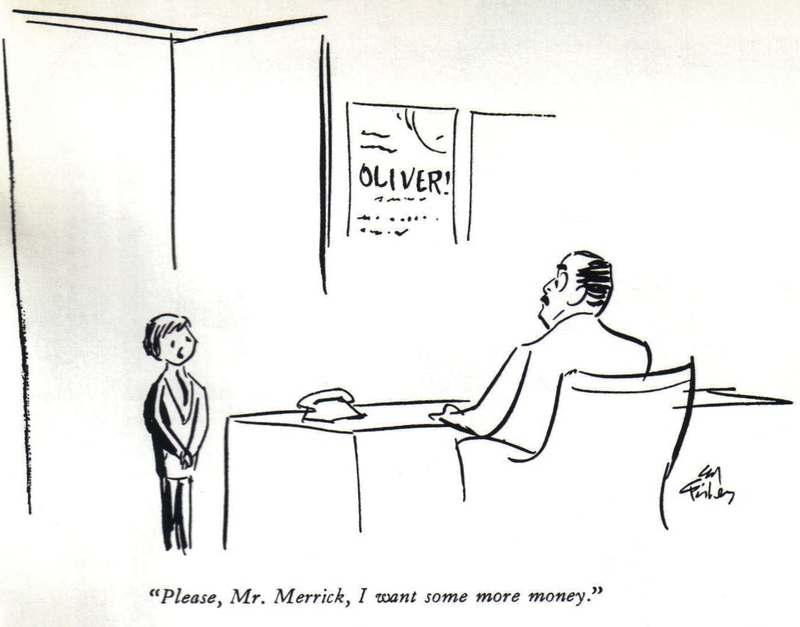 One can imagine nowadays the sort of post-Sondheim dissonance many a composer would set for Oliver! 's workhouse opening (think Sweeney Todd's shrill whistle); which is nothing like Bart's "Food, Glorious, Food" a tune riding a cloud of optimism, with increasing tempos. British musicals were too often twee, stuck in the operetta mold favored by Coward; especially when dealing with historic or period stories. Here's where Oliver! broke the mold. There's nothing pastiche, or old-fashioned in the score. It subscribes to the then current Bway standard--serving the story with a score in a contemporary idiom that doesn't sound anachronistic and works in concert with the historic material. This would be pushed into new territory once rock became the new theatrical currency, but here it was still vibrant in the waning days of popular (i.e. Bway) songwriting. And there's plenty of variety in the score. "Boy for Sale," is a dirge for tenor--one trafficking in slavery. Two pub songs, "Oom-pah-pah" and "It's a Fine Life," are convincing enuf to be geninue tavern staples. "Where is Love?" is simplicity itself and entirely credible from the mouth of a child. The show's two production numbers, one for each act, are musical comedy heaven. Critics compared "Who Will Buy" favorably with Gershwin's market cries in Porgy & Bess; for my money Bart's is more enjoyable. And just to think of "Consider Yourself" is enuf to make one smile. It's probably true there are any number of songs that could be said to be like it, but I simply want to consider it unique. And still we haven't mentioned "Be Back Soon" or "Pick a Pocket or Two"--charm songs for a rascal; the latter a syncopated tongue-twister, the former a jolly pied-piper march. At least these have some relevance to the plot. "I'd Do Anything," (perhaps a trunk song?) is entirely tangential, but so delightful that it justifies inclusion. With its prominence in the finale, one can infer Bart intended it to be the breakout hit; it wasn't, but had some life outside the show. The chart-maker was Nancy's torch song: "As Long as He Needs Me," rushed first to Shirley Bassey (and covered by the dozens: Judy Garland, Eydie Gorme, Sarah Vaughn, Doris Day, Sammy Davis, Liberace, Anita Bryant, Kate Smith, Ann-Margret, Mantovani--continuing to this day, with the likes of Matthew Morrison, Lea Salonga, Samantha Barks; to name just a few.) Despite its popularity I've always found the song a real endurance test--not just for its masochistic sentiment (another rationalizing battered woman) but its whiny melody that requires Nancy to bellow. And could someone please tell me when she sings: "Oh yes, he does need me/In spite of what you see" Who is this "you" she's addressing? Nit-picking, yes, but just about everything else is stellar. What makes Oliver! special, is not that Bart sets Dickens to music; but that he finds it between the lines. London doesn't join together in song to welcome Oliver; Nancy doesn't mull her dead-end relationship; Fagin doesn't send his juvenile gang to work chanting a loyalty march in Dickens--these are Bart's found moments; the sort that elevate and justify a musical. Fagin's soliloquy "Reviewing the Situation," taps into Bart's Jewish heritage. With different lyrics you could easily accept Tevye singing this tune (and what an interesting Fagin Zero Mostel might have been). The much-debated anti-semitic flavor of Dickens' characterization (tho inbued with affection and sympathy as well) has increased over time, and continues to vex interpretations. Alec Guinness's Fagin-as-Baba-Yaga performance in David Lean's '48 film (with Anthony Newley as his Artful Dodger) was deemed too insensitive so soon in a post-Holocaust world; and hindered the British from bringing it to New York for three years. But does Fagin really need to be Jewish, dramaturgically speaking? Unlike Shylock, whose identity and interactions are all predicated upon his being a Jew, Fagin is of potentially neutral ancestry. Bart doesn't neuter Fagin, but by necessity does make him a musical comedy villian: slinky, eccentric, loveable. The stage production was the very model of modesty and economy (no doubt one of the reasons Merrick was so keen on it.) Its threadbare theatrical charm; playacting an epic in a shoebox, brought the performance, and the music to the forefront, stimulating the imagination. 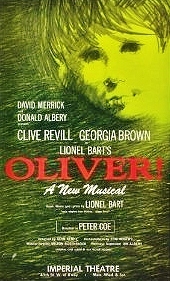 A good quarter century before Les Miz made much hay of its unit set, Oliver! made stage pictures on its turntable, building locations and effects from pieces of wood & steel assembled, reconfigured and transformed before the audience's eyes. Sean Kenny's sets were so highly regarded they overshadowed even Lionel Bart's accolades. But of course they were the antithesis of cinema. Who wants Dogville in Panavision and Technicolor? Oliver! was a Hlwd film in name only (via Columbia Pictures financing and marketing)--helmed by an inauspicious British producer, John Woolf, and filmed at Shepperton Studios outside London, over a six month shoot. An intriguing choice for director was Sir Carol Reed, known for his classic British noirs, The Third Man, Fallen Idol and Odd Man Out--more Cukor than Coppola. The Dickens tale is plenty noir as well, tho it was Reed's first and only musical. The show's stage director, Peter Coe, wanted no part of polished dancing, thus dispensed with a choreographer. Reed wasn't nearly so foolish, and gave over virtually all the musical sequences to Onna White--who was in ever greater demand after The Music Man; and might be considered here as equal a co-director, if not more so, than Jerome Robbins was to Robert Wise. Likewise, both would win Oscars, tho White's was honorary and not a co-share; and Reed's like Cukor's was a clear collective honor for lifetime achievment. Much as Oliver! elevated the British musical, Reed's film showed the British film industry equal to anything happening in Hlwd. Certainly there was little Hlwd influence in the casting. For Fagin, Reed honored the role's originator, Ron Moody--tho he hadn't crossed the pond to put his mark on Bway and was virtually unknown in America. Georgia Brown brought her Nancy to New York (adding 15 year old Alice Playten as her new Bet) but projected a darker, older image, so Carol Reed went with another rising British actress/singer, Shani Wallis, who had been a replacement Irma La Douce in London, as well as Cherie in Bus Stop. Tho the same age as Georgia, Shani was a younger, softer, lighter, Nancy--but unlike Petula Clark or Tommy Steele, Wallis didn't parlay her role into a mini Hlwd flirtation. A Welsh comedian (from BBC's Goon Show) who moonlighted as a bel-canto tenor, Harry Secombe--off of his lead in another Dickens musical, Pickwick, was featured as workhouse beadle, Bumble. 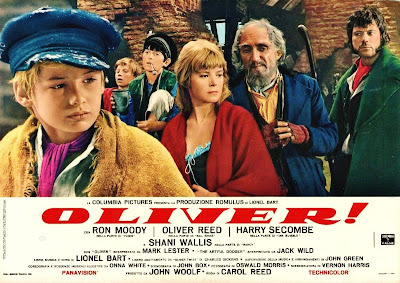 Reed chose a nine year old blonde boy, Mark Lester, as his Oliver, for his beatific face; later finding his singing voice so inadequate it was dubbed by musical director John Green's young daughter (but kept secret for 20 years). Already a cinema veteran, Lester would make another dozen films and retire from acting at age 19, to become an osteopath. (His latter day fame concerns speculation and rumor that he is biological parent to at least one of Michael Jackson's children.) 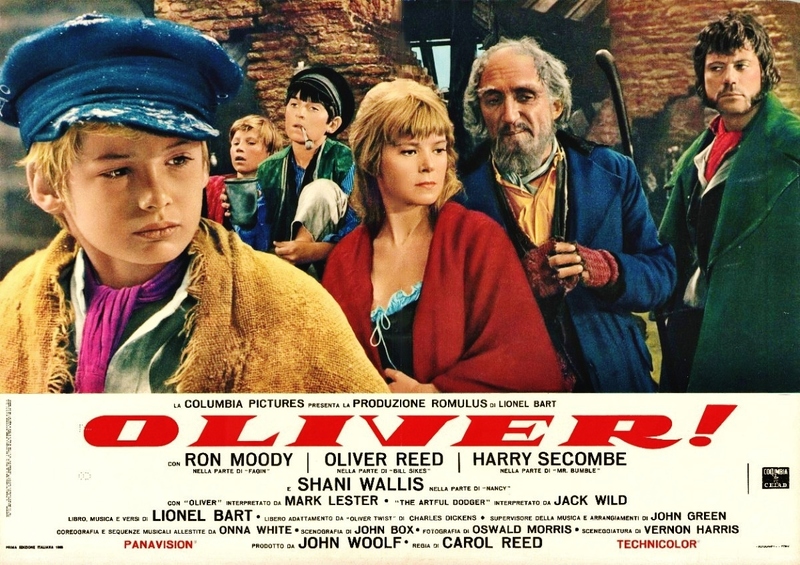 Fifteen year-old Jack Wild was given the plum role of Artful Dodger, got an Oscar nomination and never crossed my radar again. And for the menacing Bill Sykes, Carol Reed cast his nephew, a strapping hulk named, ironically, Oliver, who'd been making mostly Hammer Horror films. As far as brutes go, Oliver Reed ranks among the sexiest ever--which in no way diminishes the terror he can evoke. I doubt there's ever been a better Sykes. (Reed later revealed more interesting colors in a couple of Ken Russell films: wrestling naked with Alan Bates in Women in Love; and exploiting his deaf, dumb & blind step-son, as Ann-Margret's second husband in Tommy.) Equally well-cast is his mongrel dog, Bullseye--one of the ugliest ever put on screen. The most familiar face in the film was a virtual cameo: Hugh Griffith--of the feral eyebrows--a familiar character actor from Tom Jones, Mutiny on the Bounty, Exodus and Ben Hur--for which he won an Oscar. Here he plays a magistrate as a myopic and impatient lush. The Brits know how to cast their Dickens. With such obvious pictoral possibilities (far beyond the unit set of Sean Kenny) it wasn't hard to land production designer John Box (Oscar winner for Lawrence of Arabia and Doctor Zhivago, and fresh off A Man for All Seasons) to construct elaborate sections of 19th century London which are endlessly fascinating to absorb--mesmerizing in detail; and so effective in transporting us to another world so quickly and completely. Inevitably, Box received his third Oscar--tho costumer Phyllis Dalton--equally as creative, and likewise Zhivago honoree--lost out to the Renaissance drapery of Zefferelli's Romeo & Juliet. Visually, the film is a continuous feast. The single most iconic image of the story, Oliver with empy bowl in hand, "Please, Sir, I want some more," captures the universal, timeless struggle of the poor and destitute against the bourgeoise; shamelessly plead by a puppy-dog blonde. (Physical beauty seems to be the only visual conveyance of pure innocence. Could an ugly Oliver Twist ever resonate as well?) There's nothing passive about the trigger to this saga--revealing an unwarranted courage in the central character that will endure much strife. Harry Secombe's furious glares and glass-shattering "More?" in response to Oliver's request are impossible to better. Thereafter thru the musical upbraiding: "Oliver/Oliver/ He won't ask for more/When he knows what's in store..." and trudging thru snow with the mournful, "Boy for Sale, Secombe's tenor is put to good, dare I say, magnificent use. The film cut three songs from the show; "I Shall Scream," and "That's Your Funeral" were early character scenes more tangential to the narrative. Following his sale to an undertaker, resulting in further mistreatment, Oliver has every reason to wonder "Where is Love," a child-like ballad that nonetheless engages the adult ear, tho the dubbing by John Green's young daugther renders Lester too squishy by half. He's already relied on to look angelic, but is actually at his best when showing spine, raising his voice. Whether it's defying Bumble while trapped in a coffin, or slapping Bill Sykes in a rage, these are among his better moments. The pic moves at a clip that first half-hour rushing headlong to the meat of the story: London. After a montage of Twist's journey along the road (something beyond the stage) he arrives thru a portal to Box's enchanted kingdom. Within moments he's being invited to consider himself at home in the world's greatest metropolis, staged on a scale equal to, if not surpassing Busby Berkeley. Like a codified chamber of commerce promo, it's a gigantic production with sections featuring butchers, bobbies, bottle washers, chimney-sweeps, newsies, fish mongers, acrobats, and publicans--hurtling over acres of sets. As the music rises to crescendo (and after the most effective half-second pause) the final refrain explodes in its brashest orchestration, fullest chorus; just as Dodger & Twist are scooped into a cart rushing headlong toward us; the teeming populace in step right behind them. It's that rarest of musical comedy highs: the popper-like rush of a production number reaching its summit; our brains reeling from the sheer, ridiculous joy. Even in the history of Hlwd's excesses, there aren't many numbers as big as "Consider Yourself." And mention should be made also of the careful attention given to the endings of songs. On stage, most numbers end with a period, if not an exclamation mark!--the better ones with a button (a twist that squeezes one last drop of surprise) that leads to applause. Without that freeze and break, movie musicals (particularly those of Bway shows) often sound awkward transitioning from song back to scene--and all the more so, the more naturalistic the tale. I've heard there are those--poor souls--who find the rules of musical comedy hard to swallow. Thus the conclusion to "Consider Yourself," rather than hold for tableaux or applause, breaks into instant urban traffic; the tune continuing on the carousel organ--leaving but a memory of the hallucination: all London in synchronized song & dance. The music department does well thru-out. Note the lovely plucked-string coda to "Boy for Sale," so mournful, so nearly Japanese; the fading fifes as "Be Back Soon" marches off the last of Fagin's boys. 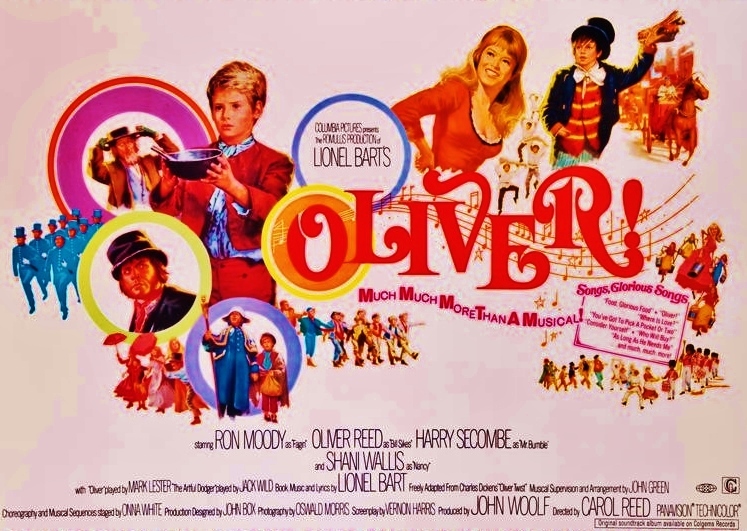 Curiously, as Oliver gets dragged further into the underworld, the songs become cheerier. Tho "You've Got to Pick a Pocket or Two" has a gypsy rhythm, Ron Moody gives it a music hall turn, his movements jerky and burlesque eccentric. I don't believe I'd noticed before how fine "It's a Fine Life" is, from start to finish --I'm astonished to find its suddenly my favorite number in the pic. Upon examination, "I'd Do Anything" is absurd--an impromptu spoof on mannered folk by a bunch of ignorant rats, turning parasols into carriage wheels and executing a group gavotte. It wouldn't work at all if the song weren't so irresistible--even Fagin joining in, returning the focus to who's the boss. Time to send the boys out to work, turning him into a comic Pied Piper with the moves of Li'l Abner's Evil Eye Fleagle. Onna White stages "Be Back Soon" as a moppet's parade deftly utilizing the major Shoreditch set with its rickety stairs and abondoned warehouses. It's a haunting, evocative mise-en-scene, later used as well for both Nancy and Fagin's solos. Shani Wallis (who often reminds me of Anne Jackson) puts her all into Nancy, leaving no longing for Georgia Brown. She's great with the pub songs, and even makes "As Long as He Needs Me," tolerable, tho the London skyline at dusk and an ear-catching cello counterpoint on the final verse do much to help as well. There really isn't a bum number in the whole show. The screenplay by Vernon Harris, simplified the musical while opening up the narrative. The movie not only allowed, but required the novel's action sequences, most of all the climactic chase and shooting of Bill Sykes. Harris replaced "I Shall Scream" (the flirtation song of Bumble & Mrs. Corney--while Oliver awaits punishment) with a simpler moment: the corpulent governors gourging on supper, outraged at Oliver's insolence--cutting to his flesh being peddled in the snow. He also dropped Sowerberry's "That's Your Funeral," simply showing Oliver's new ceremonial position as bearer for children's funerals, instead of explaining it in a song. (This was the role Barry Humphries--before discovering Dame Edna--played in both London & NY) Bill Sykes' single aria, "My Name," is deemed likewise superfluous, tho the tune is effectively used in underscoring as his theme. The screenplay fills in the details of Oliver's capture and arrest; his rescue in court by Brownlow, injecting a bit of Dickens' comic portraiture with Griffith's magistrate. This then frees up the second act from more exposition; the events related by Fagin's boys after a just-filler "Oom-pah-pah." Instead the picture follows intermission in radical contrast: the pristine whiteness of good fortune; Oliver's newfound salvation and Onna White's second tentpole sequence, her Bloomsbury ballet, "Who Will Buy?" If this once seemed the equal of "Consider Yourself," I find flaws in it now--which is not to say there isn't much to enjoy. But Kathee Green's barely-there voice weakens Lester's hold on the song; especially against the hordes below. But even with all sundry trades and neighbors cavorting, the street seems a bit too large for the number. Still, it concludes pleasingly with a military parade, and a fading drumbeat on the soundtrack. 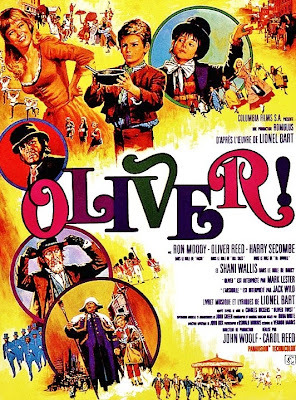 Harris's script tightens the dramatic noose skillfully thereafter, and even imbues "Oom-pah-pah" with a dramatic tension it never had; the movie's final song beomes a diversion staged by Nancy to rescue Oliver--an action that leads to her murder. The final chase and Sykes' death are enuf drama without using Dickens' equally grim coda for Fagin. The rascal gets away here, in the end, once again "Reviewing the Situation," in a deserted alley with a rising scarlet sun on the horizon. Reed has Dodger pop up from behind a pillar, and the two dance off like cartoon rabbits. The film ends quite abruptly after that; just the mere shot of Oliver back in the arms of Brownlow. A little flat for a musical, but the credits roll over the final minute of "Consider Yourself." Oscar nominations went to Vernon Harris for his writing, and John Green for scoring, which shut out Lionel Bart from any glory; and also hinted at how much the movie restructured and reimagined the musical. As a homegrown product of Britain, and a matter of national pride, the film premiered in London on Sept 26, months ahead of a stateside release. The Bway premiere was at Loewe's State on December 10th (my 16th birthday as it were); and in Hlwd ten days later at Grauman's Chinese. All told it earned $16,800,000 in film rentals; a healthy profit, if short of stratospheric. But consider this: the only film Bway musicals more lucarative were the decade's three other Oscar Best Pics and the nominee it beat; the first and only time two Bway musicals would duke it out the same year for the top prize. It earned 11 nominations, and won 5 awards (6, if you count the honorary one for Onna White--and in the ads they did); for Scoring, Sound, Art Direction, Carol Reed for direction, and the ultimate crown. The victory was somewhat of a surprise, but not cause for disdain. Over time the film has unfairly been derided as one of the worst Best Picture mistakes in the history of the Academy Awards, along with The Greatest Show on Earth, Chariots of Fire and Crash. I beg to differ. 1968 was a transitional year in culture as well as society. Roadshow musicals were then the studio blockbusters--still chasing the holy grail after The Sound of Music. But three years later none had yet hit that jackpot, and several tanked embarrassingly. Come '68 the big guns were going for broke. Not much was expected from Paramount's Half a Sixpence, nor delivered, but Columbia's Funny Girl showed there was life in the game yet. On its heels, Warner's Finian's Rainbow faltered, to no real surprise, but expectations were sky-high for Fox's Star!--another show biz bio--this one a Hlwd original (with old songs), starring the country's number one box office attraction, directed by the man who twice turned Bway musicals into game-changing Oscar winning pics. What could be more surefire than Robert Wise directing Julie Andrews as Gertrude Lawrence? Parallels to Funny Girl were uncanny; the out-of-step chorus girl destroying an ensemble number by accident; the determined up&comer destorying a number on purpose; the diva challenging her betters; the troublingly absent co-stars (where's Bea Lillie? ); the struggle of career over family; boring money troubles; the stormy romance. On the surface, Lawrence seemed as credible a fit for Andrews as Brice was for Streisand. But in locating Gertie's pulse, Julie's warmth and personality got lost in a brittle and frankly unsympathetic performance. Worse, the script was a terrible, incoherent mess; a disservice to all involved, especially to the memory of Lawrence--whose rep never really recovered. Its not such a stretch to think that initial reaction to Oliver! was in part more enthusiasm for the relief it gave Hlwd that a musical could still be done well and prove popular with the American public. Bway was having its own growing pains that fall. After the disastrous '67-'68 season (captured so brilliantly in William Goldman's seminal book, The Season) the only musical really left standing was Hair--hailed as the future of the American Musical Theater, but in reality just an anomaly, not the new formula. '68-'69 brought another Shaw adaptation, Her First Roman, written by far lesser talents, starring recent Tony winners Richard Kiley & Leslie Uggams, which quickly bombed. As did a confused Shirley Jones/Jack Cassidy vehicle, Maggie Flynn--half kiddie-fest, half serious historical romance. Newly crowned "concept" director, Harold Prince, brought in Kander & Ebb's Zorba, with a sense of immunity, but mixed results. And then just days before Oliver! hit the screen, David Merrick, whose musical acumen had been slipping, finally scored another hit: Promises, Promises. News of the project had me worried from the start. For one thing it was a tuner based on my favorite non-musical movie, The Apartment. Who could take the place of Lemmon & MacLaine? Nor was I excited by the idea of a Burt Bacharach-Hal David score--a prospect stolen from solid show-writers like Stouse & Adams or Cy Coleman & Dorothy Fields. Despite all odds, it turned out to be a terrific show, with a score, if not among the greatest, certainly one that's contextual and of-the-moment, preserved forever as an artifact of the late '60s, as different yet as defining a sound as Hair. The Main Stem was still a regular supply shop to Hlwd; aside from the four musicals released in '68, Bway plays on the screen included The Killing of Sister George, The Subject Was Roses (with Oscar nom for Patricia Neal and win for Jack Albertson); The Odd Couple (the year's #5 grosser); and The Lion in Winter, largely expected to win the years top prize. (It won Kate Hepburn a third Oscar, in a once-in-a-lifetime-tie with Streisand.) Another nominee, Zefferelli's Romeo & Juliet had well-trodden stage roots as well. Hard to say whether such (unconscious?) bias for proven material had relegated more noteworthy cinematic achievments like 2001: A Space Odyssey, Rosemary's Baby or The Battle of Algiers to also-ran status. But the scent of Bway was in full flower. They also gave Mel Brooks an Oscar that year, for his madcap Bway send-up, The Producers, which conquered Bway itself three decades later, and ricocheted back to Hwld. Oliver! was the last "old-fashioned" triumph for the Academy. Beginning with an X-rated shocker the following year, Hlwd swiftly shifted gears to a different sensibility. Tho there was more Big Bway to come, Hlwd was riding a new wave of fresh talent that took it sources from anywhere else. My familiarity with the musical came long before the movie. Oliver! was among my first dozen records. By age ten I was presenting my mother a list of Bway shows I wanted for December presents (birthday and Christmas) Tho I hoped she'd choose the less common, inevitably I'd get what was easily found on the shelves of the local record shop; thus in '63: Oliver! Several years later, it was the school musical at my Junior High, and naturally I fancied myself as young Twist--offering a falsetto '"Where is Love," without a trace of self-consciousness (or, I suppose, awareness) in audition. To my astonishment, not only did I not get the part, I wasn't even granted a spot as a chorus urchin--and consequently never sang in public again. My sole contribution in the end was designing the program cover--even then a lame copy of the Bway logo. By then I had long loved the record; its intimate orchestration, its menu of merry tunes, so catchy, not at all pedestrian. 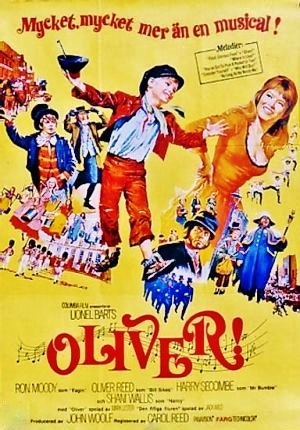 But shadowed by 8th grade disappointment, I moved on to other musicals until the movie brought Oliver! back into my life. I don't know why it took me until July of '69 to get to it at our nearby Century theaters. I had just seen Finian's Rainbow, and Funny Girl there and Camelot at the tiny art house where I worked 3 nights a week; and soon after would see Sweet Charity and West Side Story--all for the first time. But in many ways Oliver! was the most satisfying, the most breathtaking in size and scope--the most comfortable in its excess, the most appropriate to its source. And yet, despite my enthusiasm, I've returned to it infrequently over the decades, only four further viewings until now. Watching it another three times (without losing interest) reveals why: It's like a ambrosial dessert that's so rich, you only crave it once in a blue moon. As with most classic works, Dickens' timeless story will never have a definitive adaptation. David Lean's film was much admired but no deterrence to future tinkerings. New versions appear periodically, and will continue as long as actors like George C. Scott, Richard Dreyfuss and Ben Kingsley want to play Fagin. The latter starred in Roman Polanski's curiously unheralded 2005 rendition, which struck me as a stunning and masterful work--a worthy follow-up to The Pianist; showing a rare streak of late-career brilliance. Having just watched it again, I found it disappointing in a number of respects next to Carol Reed's picture. For one thing, the casting seems more "Dickensian" in Oliver! ; and there's no comparison when it comes to the scenery. But despite the agile writing (by playwright Ronald Harwood), the expanded and additional scenes, the well-researched social details, and the effective tension of the story, mostly I found myself missing the songs. "It's a Fine Life," "Be Back Soon"